FLIR thermal imaging cameras are being employed by a leading embedded electronics specialist to detect faults in printed circuit boards at an early stage. One of the larger providers of embedded electronics in the Netherlands, 3T uses FLIR’s high performance T420 thermal cameras to capture faults in PCBs by detecting temperature differences on PCB components. 3T serves a number of demanding market segments including machinery, professional equipment, instrumentation for measurement and testing, communications systems, innovative consumer products, and medical products. PCBs are complex in design, sometimes even having over 2,000 different components including a few barely a millimetre in size. Detecting faults in these components that can potentially lead to a PCB failure can be tedious. 3T has been using thermal imaging cameras for many years throughout its manufacturing to detect hotspots of less than 125 microns. Ronald van der Meer, hardware engineer at 3T explains that thermal imaging is a very good way to diagnose PCB boards in an early stage of a problem. PCBs can heat up due to reasons such as improper soldering of a circuit or a failing component. 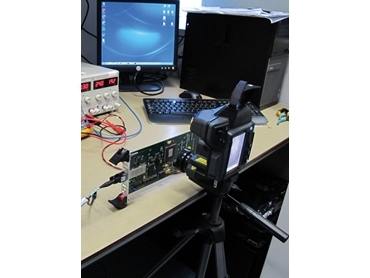 FLIR cameras are therefore used in the design phase of a PCB to test it before it is supplied to the customer. 3T recently chose the FLIR T420 bench test thermal imaging camera with 50µm close-up lens for their testing. Ronald van der Meer explained that the close-up lens was absolutely necessary as the focus distance was too big without the lens, given that the mass of the PCB components was so little, and possible temperature changes extremely small. Though thermocouples are also used as an alternative to thermal imaging in PCB electronics testing, and are even still required by certain regulatory bodies, Ronald van der Meer says that the use of a thermocouple, which consists of two wire legs that contact each other at one or more spots, can actually disturb the measurement because they need to make contact with the tiny components on the PCB board. Thermal imaging on the other hand, is a non-contact technology, eliminating any issues. A high performance, yet affordable thermal imaging camera, the FLIR T420 combines excellent ergonomics with high image quality of 320 x 240 pixels. A tiltable optical unit allows measurement and imaging of objects at any angle while still maintaining a comfortable working position. Ronald van der Meer comments that the T420 camera is very robust and easy to carry, which is an advantage since they have to sometimes use their camera at customer sites. He adds that the close-up lens delivers high image detailing, allowing them to see the smallest faults. FLIR’s ResearchIR software for R&D applications is an essential part of the 3T thermal imaging package, allowing their researchers to make high speed recordings and perform advanced thermal pattern analysis. For instance, when they need to capture the precise response of a one-time thermal event, they use the camera to make high-speed video images, helping them reconstruct and analyse the problem more accurately. Video images obtained with ReserachIR are also imported into MATLAB for data visualisation and programming. FLIR’s ResearchIR software allows 3T engineers to better analyse PCB hot spots and find thermal peaks. The software’s colourisation control allows users to change the colour palette, colour distribution, contrast and isotherms, zooming and panning to suit their preferences.